The Parkway is just 15 minutes from the Inn. Take a leisurely drive to view the outstanding scenery and recreational opportunities. There are abundant hiking trails, picnic areas and interpretive exhibits. Walnut Creek is a 10 minute drive from the Inn and features beach swimming, fishing, canoe rentals, 15 miles of biking, hiking and running trails and 18 hole disc golf. Experience the splendor of the Blue Ridge Mountains as you float over Central Virginia in a hot air balloon. Launch right from the top of our property. This outfitter provides canoe, kayak, tubing and rafting tips down the James River. View bird and wildlife while river tripping then relax on a sandy beach. Located just 20 minutes from the Inn. 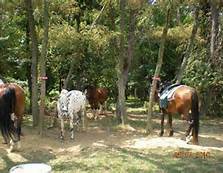 Climb in the saddle and take a private ride through the Blue Ridge Mountains and select vineyards in the Charlottesville region.